Artificial intelligence + Blockchain technology. 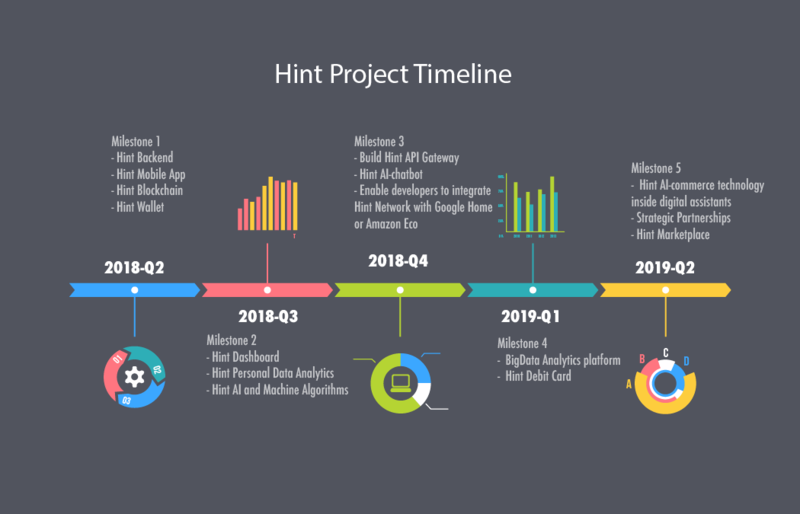 HINT is a mobile app, AI-chatbot, and smart AI-commerce technology for voice assistants on top of intelligent HINT network: – a distributed, privacy enabled data analytics platform using blockchain technology. HINT platform users will be able to share digital data and collectively pull valuable insights whenever and wherever, they want, as open tap on the crowdsourced data. Find products & services faster and more easily. Have total visibility into all products available in your locality and globally. Personal data analytics dashboard will provide users with advanced analytics capability and friendly user interfaces that would enable autonomous an informed decision making. Real-time dashboard and spending overview. Automatically orders groceries from your favourite store. Unified timeline for all your purchase history. Hint reminds you what needs to be stocked in your pantry at all times. Your personal chat bot that help you with the decisions while shopping online or in-store. Anonymous – Ownership of the receipt will always be private and visible only to the owner. Highly secure – you own your data, period. Store receipts in IPFS and Blockchain database. Automatically list your products in HINT Market place. HINT mobile app captures receipts and store digital copy in a secure decentralised database. Hint platform users will be able to share receipt data and collectively pull valuable insights whenever and wherever, they want, as open tap on the crowd sourced data. HINT’s sophisticated, flexible API platform that works so fast. Developers should able to integrate with Google Home and Alexa to request real-time product information. Hint aims to widen cryptocurrency footprint by rewarding users with Hint tokens whenever they shop. Let’s build the collective intelligence together. Hint is a mobile app, AI-powered chatbot and a distributed database that stores your digital data using blockchain technology.